Give your mom a break on this Mother’s Day! 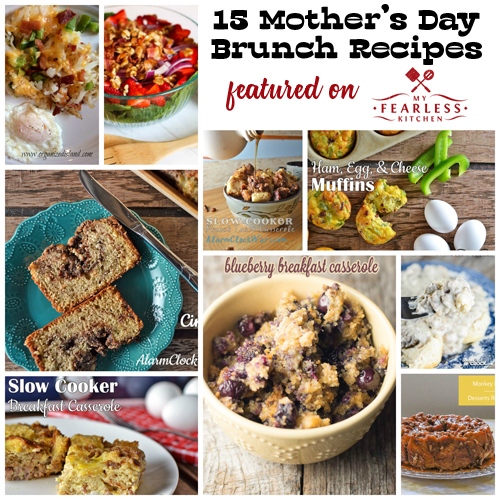 My friends and I have 15 fantastic Mother’s Day Brunch Recipes that you can make for your mom! I just know your mom (and you!) will love these recipes. These brunch recipes are perfect for a late breakfast on Mother’s Day or any day! This Slow Cooker French Toast Casserole is a big favorite, at our house and on this blog! This Country Potato Bake from Jeanette at Fencerow to Fencerow looks so yummy, and so easy to put together! Ham, Egg, and Cheese Muffins are an easy way to get breakfast in the oven and then enjoy some family time. We love a good breakfast casserole around here, and this Crock Pot Southwest Breakfast Casserole from Aunt Lou at Recipes that Crock is perfect! The banana means it’s good for you, and the nutella means it’s oh-so-bad. Check out this Banana Nutella Bread from Betsy at Desserts Required. I love overnight oatmeal in the slow cooker. This Brown Sugar Oatmeal is my favorite. Kimmi from Kimmi’s Dairyland makes this amazing Cascade Scramble for brunch. Want something colorful and healthy? This Strawberry Spinach Salad from Liz at Farm Wife Cooks is bright, colorful, and ready for spring. This Cinnamon Bread is an easy quick bread that tastes like dessert. I can’t wait to try these Bacon Hash Browns from Raquel at Organized Island. They look like heaven on a plate! Check out this Crock Pot Blueberry Breakfast Casserole from Cris at Recipes That Crock. Like a blueberry cobbler, but for brunch! This Pumpkin Pie Baked Oatmeal is a fun different way to enjoy oatmeal for brunch. Do you love biscuits and gravy? Make this Sausage Gravy in your slow cooker from GOODe Ole Boy at Recipes That Crock ahead of time and enjoy it all morning. This Monkey Bread from Betsy at Desserts Required is the perfect sweet end to your brunch! Are you looking for a classic? This Slow Cooker Breakfast Casserole is our holiday tradition. How are you going to spoil your mom for Mother’s Day? I could eat all of these any morning! They look delicious! Thank you for including my hash browns! It was my pleasure! Your Bacon Hash Browns look amazing, and I know one father around here who will really enjoy them!